Microsoft has secured cloud-based identities for more than a decade. With Azure Active Directory Identity Protection, in your environment, you can use the same protection systems Microsoft uses to secure identities. The vast majority of security breaches take place when attackers gain access to an environment by stealing a user’s identity. Over the years, attackers have become increasingly effective in leveraging third-party breaches and using sophisticated phishing attacks. As soon as an attacker gains access to even low privileged user accounts, it is relatively easy for them to gain access to important company resources through lateral movement. Discovering compromised identities is no easy task. Azure Active Directory uses adaptive machine learning algorithms and heuristics to detect anomalies and suspicious incidents that indicate potentially compromised identities. Using this data, Identity Protection generates reports and alerts that enable you to evaluate the detected issues and take appropriate mitigation or remediation actions. 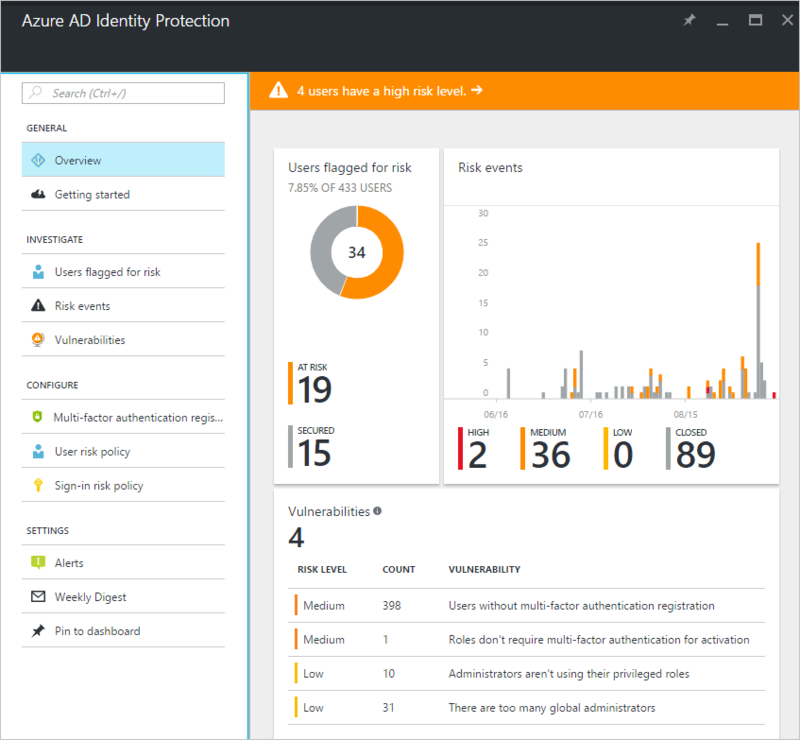 Azure Active Directory Identity Protection is more than a monitoring and reporting tool. To protect your organization's identities, you can configure risk-based policies that automatically respond to detected issues when a specified risk level has been reached. These policies, in addition to other conditional access controls provided by Azure Active Directory and Enterprise Mobility + Security (EMS), can either automatically block or initiate adaptive remediation actions including password resets and multi-factor authentication enforcement. Azure Active Directory Identity Protection analyses your configuration and detects vulnerabilities that can have an impact on your user's identities. For more details, see Vulnerabilities detected by Azure Active Directory Identity Protection. Azure Active Directory uses adaptive machine learning algorithms and heuristics to detect suspicious actions that are related to your user's identities. The system creates a record for each detected suspicious action. These records are also known as risk events. For more details, see Azure Active Directory risk events. Your journey through Identity Protection typically starts with the Identity Protection dashboard. It is typically your starting point for investigation, which is the process of reviewing the activities, logs, and other relevant information related to a risk event to decide whether remediation or mitigation steps are necessary, and how the identity was compromised, and understand how the compromised identity was used. You can tie your investigation activities to the notifications Azure Active Directory Protection sends per email.